There is an ant-hill in the American South-West where the ants are superintelligent. These Ultimate Ants have created an underground city that rivals the greatest human capitals. Drona is the super-powered champion of that ant-hill. 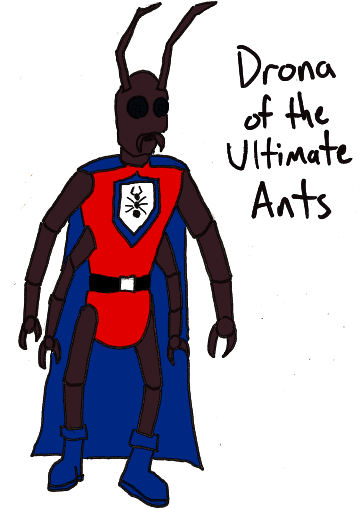 Drona is an ant-man with the basic super-strong, super-fast, and flying type powers. But he’s about an inch tall. I like the idea of this tiny superhero when he has to leave the ant-hill and interact with heroes way bigger than he is. One of the most likely inspirations for the Ultimate Ant-Hill is probably the Bottle City of Kandor and the Superman Emergency Squad. The Ultimate Ants are different from the Hypercolony that I have in my SecGov Universe, in that the Ultimate Ants act like a city of people that are ants, the superintelligent ants of the Hypercolony is a colony of ants that act like ants, and are worshipped by human cultists. The alien world Zunoltia is a pretty nice place, but that makes it a nice target for alien invaders. Fortunately, the cosmically-powered Astro-Hero is there to save the day. The Astro-Hero’s powers include manipulation of gravity and light, either of which would be powerful, but together she is can make short work of all Zunoltia’s enemies. But she does not limit herself to protecting only her homeworld, the Astro-Hero soars all over the galaxy fighting against injustice wherever she finds it. I’ve discussed my desire to see more aliens that don’t look like humans before, so there’s a bit of that to the Astro-Hero, but also as a female member of her alien species, it’s even more important that she look less human. Alien women in comics, even when they’re explicitly of species that are evolved with reptilian or avian traits, have the massive mammaries that superhero comics love so much. 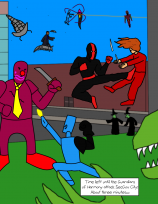 So the Astro-Hero hits checks my boxes for both improving depictions of aliens and of women. So that’s that. Both of these guys were drawn on the spot with little forethought. Basically, I wanted to have some of that type of superhero that has a chest-emblem, and these were the results. The weird alien symbol on the Astro-Hero’s costume is a Zunoltian character of some kind, maybe it means “Astro-Hero” or whatever. Drona’s ant emblem is symbolic of his ties to his ant community. There you go.